I started my FITS preparations right after New Years in New Mexico, our last hundred: what went right, what went wrong, etc… Overall, the ride went smoothly, and we had gotten another COC checked off our list. In planning for FITS, I had in mind about an 11-hour ride time. That seemed sensible, because previous years had ride times in the 8 hour range. I was still, however, focused on our ultimate goal: another Certificate Of Capability (a ride time of 13:20 or less). I was told that the course was very easy, and if I rode right, a COC should not be a problem. Ultimately, my long-term goal is to go to the 2009 Young Rider World Championships. But, one step at a time. For FITS, I would again be riding Darolyn Butler's horse, DJB Cytron Kon JMF, who was my mount for the hundred back in December. My mother and I flew into Tampa Bay International Airport on Saturday, the day before the race. 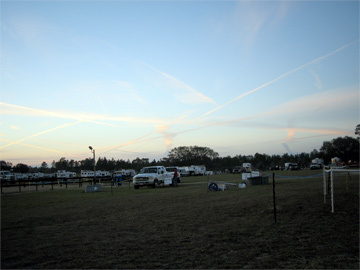 By early afternoon, we pulled up into the race site. Darolyn Butler had brought the horses up a few days prior so that she and her daughter, Ceci, could do the 50 the first day. At that point, it seemed like the stars were lining up. I suppose the first hint of the trouble to come was when Darolyn and Ceci came back from their last loop on the fifty. Apparently, several days of rain had left feet of standing water over a large portion of the course. I guess "several feet" didn't sink in at the time when I was standing on perfectly dry land. After a few paperwork scuffles and a pre-vet check, I had everything ready to go. For those riders who haven't ridden with me, I am obsessive in capital letters about strategy. I like to know at any given time exactly what kind of total time I'm pacing for, where I am in the pack, how our times compare to previous rides, how our recoveries compare, etc... So, as typical, I ran around a bit the day before the ride crunching numbers and tracking down loop orders. The ride meeting is usually where I put the finishing touches on my plans because things have a funny way of changing before the ride meeting. However, they informed us that there was some water on trail, so deep in places that the four-wheeler couldn't get through. I don't know why at that point I still didn't realize what I was getting into; I live in Houston and have seen numerous hurricanes pass through. But, everything was prepared and pre-set for the FITS FEI*** 100, so I went to bed. The 6:30 am start went off without a hitch. My mother and Ceci's husband, Jason, have crewing down to a science. And Darolyn had brought in a woman from Namibia, who turned out to be an excellent addition to the crewing team. After the first four miles, the sandy footing became a lake. Honestly, I have never seen anything like that next 35 miles. I discovered that this was not the easy hundred I had expected. As far as I could see, the trail was just deep, uninterrupted water. We were definitely riding through a swamp. The first two vet checks were out of camp. I tried to dry off after the first check, but I soon realized that from my tights down would be soaked all day. That nice first four miles of trail soon became a very deep stretch of sand, which turned uphill the last mile into camp - not great for heart rates. It wasn't until the 50-mile point that we finally looped back into camp. Upon returning tocamp for the first time, my crew barraged me with news of top riders being called for rechecks and several pulls. My horse vetted in fine - there were several times when riders would blast past us on trail, spraying us in water, only for us to out-recover them. Finally, when I went out after the halfway point, the trail seemed to dry out some. Though there was still water, there were long stretches of trail that were water-free, and even the flooded parts of trail were much shallower. Still, the damage was done. Fifty miles of deep water will hurt any horse. Horses had been pulled left and right, and these were some of the top horses in the country. 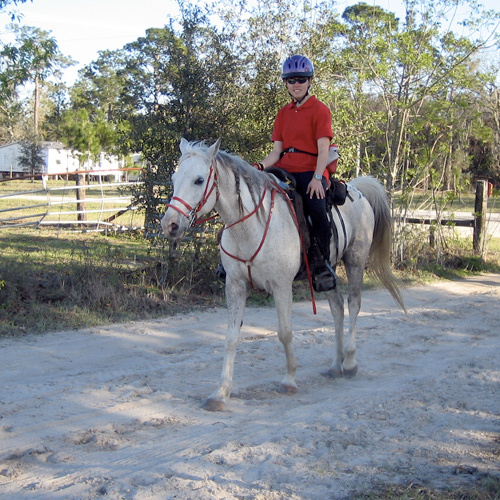 The lovely Colombian girl I had been riding with was pulled, so I rode mostly alone after the fifty-mile check. Early in the day, we both had been riding with Darolyn and Ceci, but elected to slow down. I decided that the Certificate of Capability (a ride time of 13:20) reigned supreme over a high placing. Luckily, Cytron moves out pretty decently alone, though I did catch a few riders on my way. I guess that's one of the really cool things about this sport - there are days when a 15 year old can catch and pass a world-ranked 45 year old. The second half of the ride also gave me a chance to meet people I would never have met otherwise. For example, I got to ride with a woman named Ruth from Canada for almost 20 miles, though we split at the 70-mile vet check. Cytron devoured everything we put infront of him in true top-competitor style. We went out for a 15-mile loop. Ride management had set it up so that the last two loops were the same, giving most riders a chance to pre-ride what would be ridden in the dark - very good thinking on ride management's part. Eighty-five miles in, Jason told me that Valerie Kanavy had done one loop out of order, and had elected to ride 115 miles for an FEI placing, and that John Crandell and Steve Rojek were out. This race was a mess. The trouble really started for us at that check at 85 miles - uh-oh. The vet saw problems. Dr. Carter is a regular at the rides back in Texas, and I've known him all my endurance career. I've learned that when he says there's something to be concerned about, I definitely need to pay close attention. He told me that Cytron's back was sore on the right. I stripped everything from my saddle, including water, to make it as light as possible. We iced Cytron, and after a 30-minute hold, I went back out again. After talking with Dr. Carter and my crew, I rode very heavy on the left in hopes of saving that right side. I thought maybe I could pull it off for the last 15 miles. Well, I certainly paid for it in spades. For riders who have ever tried to ride heavy on one side, you will know what I'm talking about. Even though I slowed down quite a bit, every time I posted, I could feel my back get worse. About 12 miles into the loop, I lost all the feeling in my legs and arms, which is a really awful sensation. I tried not to think of the damage I was doing to my poor back - at least I was saving my horse's. I crossed the finish line in ninth place, a ride time of about 12:20. Thank god my crew was at the finish line, which was posted almost a mile from camp, because by the end, I was half-conscious and in such pain I couldn't breathe. I got to camp and slid off my horse. My crew really did an awesome job, because I just handed the horse over and tried not to pass out. Within a couple of minutes, Cytron had pulsed down. His metabolic status looked very impressive for having just done 100 miles. I sat in the warm car, easily within eyesight of the vet check, watching my crew to ensure no final problems. I saw the first trot-out, and I could see from thirty feet that his gait wasn't right. Dr. Carter asked for a recheck, and so my crew massaged and messaged and iced and messaged again. They truly did everything possible for that kind of situation. I got out of the car when Cytron trotted for the recheck, and he still wasn't sound. I didn't even have to ask - Dr. Carter's face told me everything I needed to know. After all the deep sand and water, after all 100 miles, we were pulled at the finish. It was such gut-wrenching disappointment. This was the first time for me to be pulled at the finish, and it is truly heartbreaking. I feel sorry for my horse, because I feel confident that having to pick his legs up so high in the deep water for so long is what did him in. I definitely think that footing was the culprit, not only for us, but for so many of America's top riders. And so, it was with many tears and pain that I realized - there are no easy hundreds. As much suffering and crying as there was for FITS, I find myself a week later making plans for my next hundred. Jeez.